We dive in on a little gravel and sandy beach and start snorkeling southwards for a few minutes. The diving is in depth of approx. 4 to 6 m. Through little canyons and lava rocks we reach the Atlantic cornetfish cave after fifteen minutes. Diving southward we reach a deep declining slope up to 35 meter deep, which we follow. Approximately ten minutes later, we find a 38 meter deep archway, which we can dive through. Behind this, at a depth of 40 to 45 meter, an imposing rock tower named the "torre" becomes visible. The "torre" is covered completely with black corals and we consider it a must dive for advanced scuba divers. We follow the course upwards up to a depth of 32m. On the roof of this rock we meet a lot of different species of fishes. We change the direction to the north and reach another 16–18m deep wall. Over the edge begins the "graveyard", which we cross and finally arrive at our final stop through a beautiful 3–7m deep canyon (30-45m). 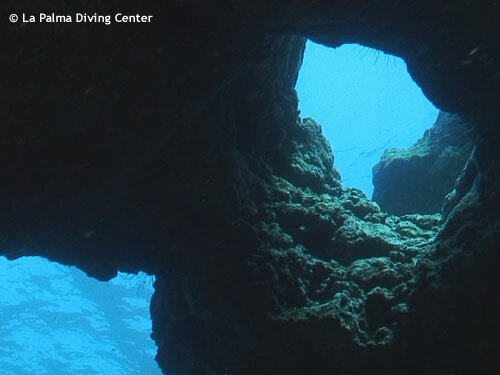 Enjoy this spectacular and divers dive site.